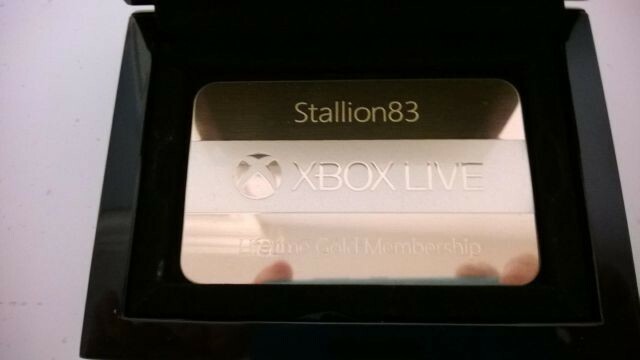 Stallion83 awarded a Lifetime Xbox Live Gold Membership card! Ray Cox aka Stallion83 (Gamertag) is a fairly well known Gamer, who's main goal in Gaming is to reach the 1 Million Gamerscore milestone. At the moment, he currently holds the World Record for the most Gamerscore, this having been confirmed by the Guinness Company. Last Sunday, Stallion topped a whopping 953,000G! With the amount of time and commitment Cox has put into playing video games, the results of his recent achievement of 953,000G had caught the attention of Microsoft. Cox was invited to attend the company's Times Square launch event for the recently released Xbox One console earlier this week. During the event, he was awarded two very special gifts; a rare White Xbox One launch team console and a 24 Carat Gold lifetime Xbox Live Gold Membership card, the first and only one to have been issued by Microsoft. These gifts were presented to Cox by Microsoft's Xbox Live director of programming Larry "Major Nelson" Hryb. A massive congratulation to Ray Cox as he storms towards his 1 Million Gamerscore milestone! Feel free to post your views/opinions on this article. Halo Franchise: A blast from the past to the present!